Abu Hurairah reported that the Prophet (peace be upon him) said: "The blessed month has come to you. Allah has made fasting during it obligatory upon you. During it, the gates to Paradise are opened and the gates to hellfire are locked, and the devils are chained. 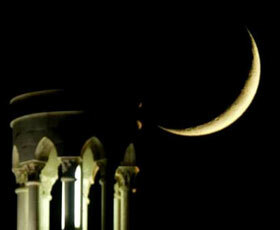 There is a night [during this month] which is better than a thousand months. Whoever is deprived of its good is really deprived [of something great]." A fasting person should try and increase their good deeds, especially in Ramadan. Abu Hurairah reported the Messenger of Allah (peace be upon him) saying: "Allah said: 'Every action of the son of Adam is for him except fasting, for that is solely for Me. I give the reward for it.'" Abu Hurairah reported that the Prophet (peace be upon him) said: "He who fasts in Ramadan due to Iman (faith) and hoping for reward from Allah then his previous sins are forgiven." A fasting person should increase in making du'a. Abu Hurairah has reported that the Prophet (peace be upon him) said: "The du'a of three persons is not refused: a fasting man when breaking the fast, a just ruler, and an oppressed person." Abu Hurairah narrates that the Messenger of Allah said, "The slave is closest to his Lord while he is in prostration, so increase your supplications." A fasting person should eat a pre-dawn meal; the suhur. Al-Miqdam reported that the Prophet (peace be upon him) said: "You should eat this pre-dawn meal for it is a blessed nourishment." It is a blessing because it strengthens the fasting person, makes him more energetic, and makes the fast easier for them. The thirst is no more, the veins have moistened and the reward is confirmed if Allah so willed. Aftara 'indakum-us-sa' imuna wa akala taamakum-ul-abraru wa sallat 'alaikum-ul-mala'ikatu. May the fasting people perform iftar within your home and may pious people enjoy the food provided by you and may the angels invoke blessings upon you! The Messenger of Allah (peace be upon him) is reported to have said that one's worst weakness is one's belly. If you must eat, make sure you fill one third of your stomach with food, one third with water and leave one third for air i.e. leave it empty. The Ramadan nightly prayer has a special merit over other nights. The Messenger of Allah (peace be upon him) said: "Whoever observes night prayer in Ramadan as an expression of his faith and to seek reward from Allah, his previous sins will be forgiven." Allah's Messenger (peace be upon him) used to practice I'tikaaf in the last ten nights and say: 'Seek out Laylatul Qadr in the (odd nights) of the last ten of Ramadan." Abu Hurairah reported that the Prophet (peace be upon him), said: "Whoever prays during the 'Night of Qadr' with faith and hoping for its reward will have all of his previous sins forgiven." I'tikaf means to seclude oneself with the intention of worship in a Masjid. A person performing I'tikaaf (mu'takif) will be able to perform more voluntary salat and be able to perform salat on time with congregation. Hence, the mu'takif acquires the reward of salat with congregation, which is twenty-seven times more rewarding than performing salat alone. The mu'takif is also able to busy himself with the recitation of the Qur'an and thikr (rememberance) of Allah amongst the company of good Muslims. Read or listen to Qur'an. Make lots of thikr (rememberance) and du'a. Pray the taraweeh in the masjid. Refrain from bad behaviour such as lying, cheating, music, smoking, backbiting and slandering others to create animosity among them. Give charity and be generous. Zakat -ul -Fitr is a type of Sadaqah which must be paid by every Muslim, young and old, male and female, free and slave, at the end of the Month of Fasting (Ramadan). The purpose of Zakat -ul- Fitr is to purify one who fasts from any indecent act or speech and to help the poor and needy. Zakat-ul-fitr is equvilant to a sa' (approx. 3 kilos) of barley or its monetary equivalent. To brush the teeth and have a bath/shower. To put on the best available dress and use perfume (men). To give away 'Eid Charity (Zaka-ul-Fitr). To eat something sweet before going for the 'Eid Prayer. To go to the 'Eid prayer by one way and return by another. To pronounce the following Takbir on the way in a low voice. Allah is the greatest, and all praise is for Allah.